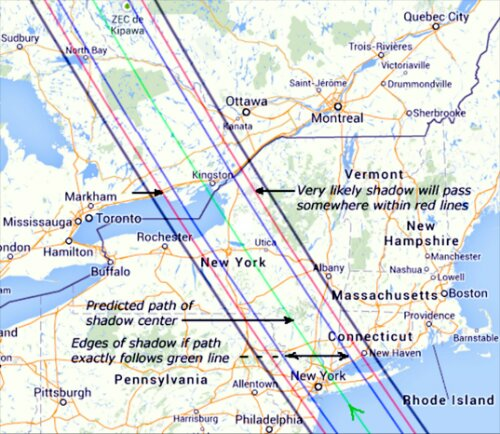 Friends living between Toronto and Ontario: Thursday morning is a gnarly opportunity to be part of the first ever crowd sourced astrometric observation experiment! This is so cool. Just after 2:06 am on Thursday EDT, March 20th, the bright star Regulus (Alpha Leonis, magnitude 1.3) in the constellation Leo will disappear for up to 14 seconds for more than 20 million people in the New York Metropolitan area and parts of New Jersey, Connecticut, upstate New York, Ontario and Quebec as the asteroid (163) Erigone passes in front of it. 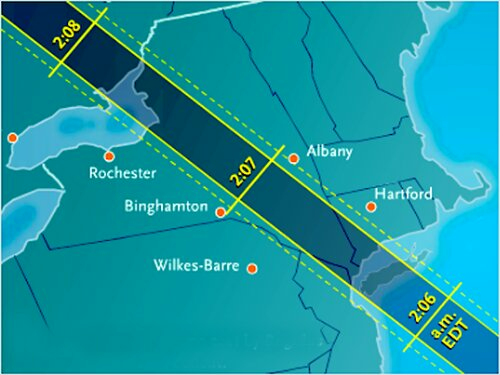 The image below shows the predicted path of the shadow of the asteroid over the ground. The idea is that by recording when, where, and for how long Regulus disappears it will be possible to calculate the exact shape and spin of the asteroid blocking it. Essentially mapping the shadow. A google map of the shadow’s path can be found here. Full instructions are on the planetary society’s web page. That is also the source of the images above. This entry was posted in Ramble and tagged erigone, planetary society, regulus. Bookmark the permalink.